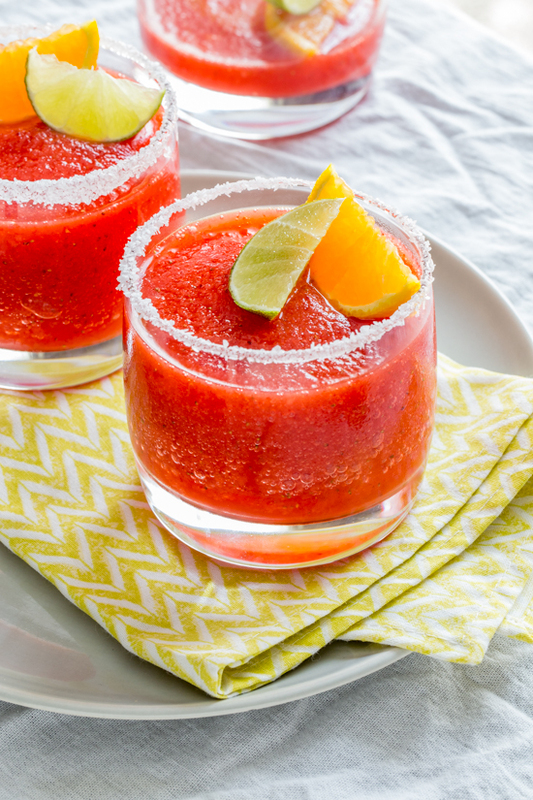 Frozen Strawberry Margaritas made with fresh lime and orange juice are sweet, tangy and oh-so-refreshing. I don’t know why I’ve never liked margaritas. I’ve tried them over and over, but for some reason they never set me on fire the way other cocktails do. The way other cocktails with, say, rum or vodka do. I’m more of a vodka girl. But – I am all about being open minded and trying new things. I convinced myself that kale was delicious and now I firmly believe it. The same thing happened with beets. They were vile, dirt-tasting things that I had to strong arm myself into liking. And now I truly, honestly do. Especially if there is an abundance of goat cheese around. But we’re not talking about beets and goat cheese today – today is Cocktail Friday and we’ll treat it as such. Bring on the cocktail! So anyway, back to me, tequila and margaritas. After I made these frozen mango strawberry cocktails a few weeks ago, I got to thinking: maybe tequila isn’t all that bad. I liked that drink, why shouldn’t I like a margarita? While I can say they are still not my ultimate fave, this strawberry margarita made with the fresh strawberries that we picked, and then quickly froze because I picked way too many, is pretty darn fantastic. It’s like a spiked slushy. My husband tends to looks down his nose when I make a ‘frozen’ drink as he would prefer something on the rocks anyway of the week, but even he finished this without (almost) any comments. Because I’m not incredibly versed in margarita making, I looked up some different ideas. 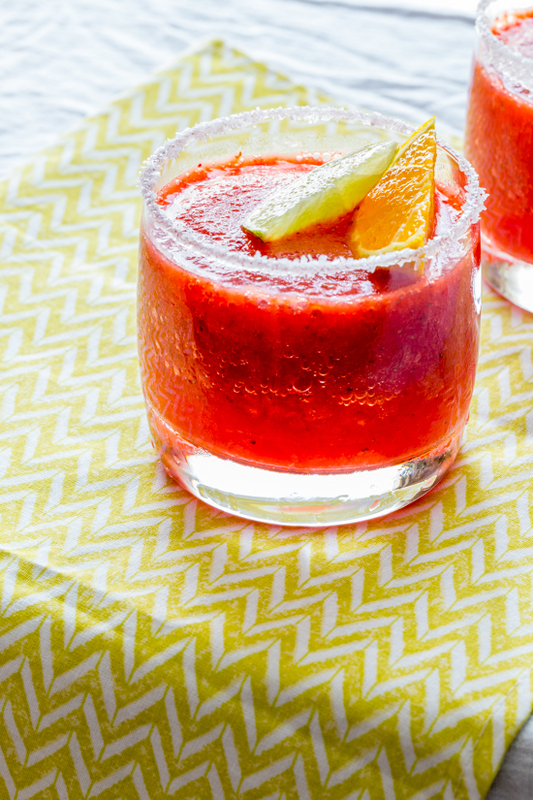 I came across this margarita recipe from Cookie and Kate and I zeroed in on her frozen fruit variation. I used strawberries for the frozen fruit and doubled the recipe. After the first time making these I felt it needed a bit more sweetness for my taste, so I used simple syrup to sweeten the drink and that was the ticket. The sweetness brought out the strawberry flavor and took just enough edge off the lime and tequila that it rounded out the flavors for me nicely. I will definitely be making another version of these frozen margaritas and maybe, just maybe, I’ll make an on-the-rocks version for my husband. I’m nice like that. Place all ingredients in blender and blend until smooth. 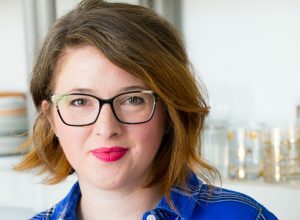 Place large ice cubes in two salt (or sugar) rimmed glasses. 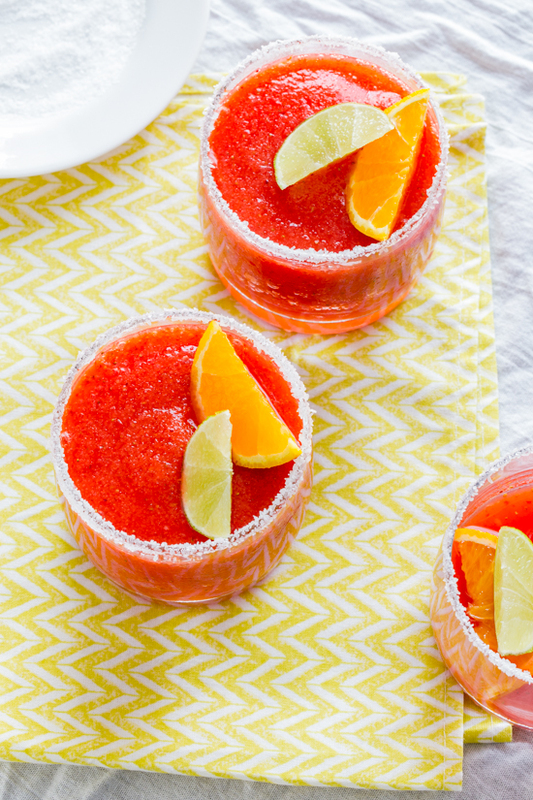 Pour margaritas over the ice in the glasses. Garnish with orange and lime wedges. Serve immediately. These are just so bright, fun and summery!! I love um! i could definitely kick back and relax with one of these margaritas right now! they look so delicious and perfect for summer! Totally agree, Thalia! Thanks for stopping by!